Monday 14 October. Business meetings of the platforms (by invitation only). 3 parallel rooms are available, each hosting ca 30 people. Check map of the premises for room details. A 5 K run will be arranged in the afternoon (see separate page). Tuesday 15 - Thursday 17 October. Open scientific programme with plenary sessions, 3 parallel sessions and poster sessions. Lunches (included in the registration fee) will be served at the Aula Magna. Check map of the premises for room details. Friday 18 October. Business meetings of the platforms (by invitation only). 3 parallel rooms are available, each hosting ca 30 people. Check map of the premises for room details. A conference dinner will be organised in the evening of Tuesday 15 October. Details will be given later. A City Hall reception will be organised on Wednesday 16 October. See information below the programme scheme for more details. The city of Stockholm invites us for a reception in the golden room of the City Hall (Stadshuset - see pictures below). 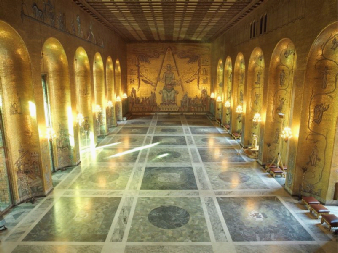 The Golden Hall has a magnificent interior, famous for hosting the Nobel Prize receptions and many other events. We will be offered a standing buffet and a guided tour of the City Hall. The City of Stockholm covers all costs and we received an invitation for 300 people. Please make sure to register early, otherwise you might miss the event! Transportation to the City Hall will be on your own. The address of the City Hall is Hantverkargatan 1, 111 52 Stockholm. More information about the City Hall can be found by clicking on this sentence.